I've been editing my manuscript all day, readying it to be passed along to a fellow author who is going to critique the entire story as a whole. I haven't done this yet, since my writing group has critiqued it in bits and pieces. It's exciting and nerve-racking at the same time, sort of like sending your child off to kindergarten her first day (which I just did a few weeks ago!). Above you'll find a current picture of my writing group. 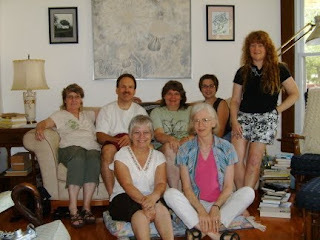 Earlier this month, Peggy Reiff-Miller offered to let us have a writing retreat of sorts at her house. We spent the day enjoying great food, editing compelling stories, and discussing current market info. Thanks to Peggy for opening up her home and showing us such a nice time.